A handful of reports released this year offer useful data for marketing and PR planning in the U.S. Knowing your audience is vital, and while you always need good local information, it also helps to see the big picture. These five publications reveal data from across the U.S. for public and academic librarians. If my overseas readers know of similar reports from their own countries, please share the title and link in the Comment section so others can benefit too. Thank you! The survey’s results confirm that libraries do a lot with limited resources, that there’s a focus on social media, and that libraries’ work does increase community awareness about their offerings. Findings show that 96% of those surveyed use social media, and 84% post photos, videos, or library information on social media. In addition, 70% send email messages. And while 71% say they don’t have the necessary staff resources, it's good to see that 25% do have marketing professionals on staff. The report is full of infographics, and is available for free downloading. 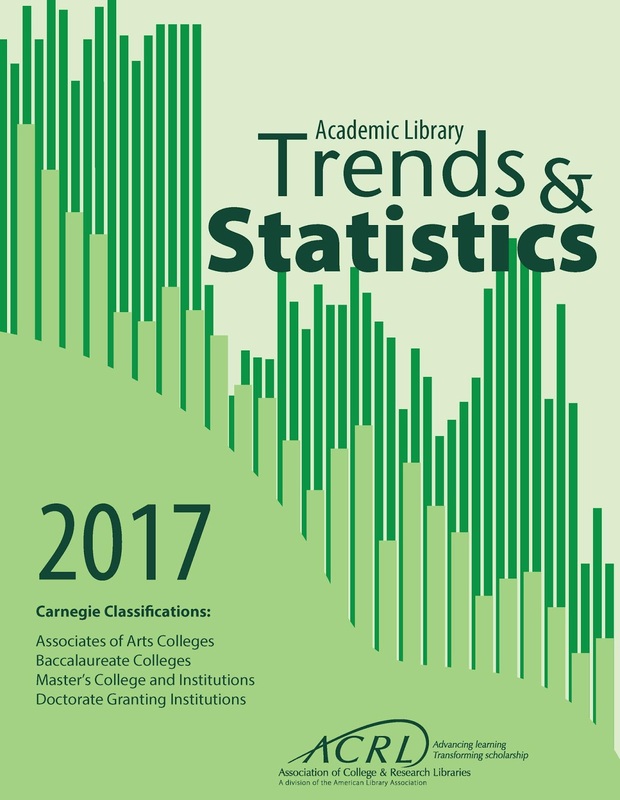 The Association of College & Research Libraries has released “2017 Academic Library Trends & Statistics,” the latest in a series of annual publications that describe the collections, staffing, expenditures, and service activities of academic libraries. It includes data from 1,719 institutions. The 2017 data can be used for budgeting, strategic planning, annual reports, grant applications, and benchmarking. The report costs $599 (or $539 for ALA members). Learn more here. Those who buy the print edition will receive a complimentary 1-year subscription to the 2017 survey data that’s available through ACRL Metrics, an online subscription service that provides access to the ACRL survey data from 1999–2017. The Institute of Museum and Library Services has released “Public Libraries in the United States: Fiscal Year 2015.” Referred to as the “Public Libraries Survey” (PLS), it examines key indicators of library use, financial health, staffing, and resources. It summarizes the reported data provided by 98% of public libraries and outlets in the U.S., which means approximately 9,000 public library systems, comprising more than 17,000 individual main libraries, branches, and bookmobiles in the 50 states, the District of Columbia, and U.S. territories. Download the PDF for free from this site. NoveList,a division of EBSCO and maker of the LibraryAware promotional platform, has gathered research to create a free white paper titled “I Didn’t Know My Library Had That!” The colorful, easy-to-skim paper is full of tips and tactics. A web page headlined “Connecting with Readers through Email” features information on how librarians can achieve more-effective marketing by sending email that is customized for and targeted to specific market segments. The page also features two different webinars in which NoveList clients discuss how these strategies worked for them, as well as links to sample outreach materials and tips. The white paper and accompanying resources are meant to help solve the problem of patrons saying, “I didn’t know the library had that!” NoveList wants to help enable simple, targeted email blasts to let community members know about seldom-used resources. OCLC joined PLA and ALA’s Office for Library Advocacy to publish an updated version of a landmark report from 2008. Now marketers can use the fresh data in “From Awareness to Funding: Voter Perceptions and Support of Public Libraries in 2018.” The research covers voters’ perceptions of, usage of, and attitudes about public libraries, as well as their thoughts about librarians and funding. As with the previous report, the new one relies on survey data from Leo Burnett Worldwide. The firm used the same questions and segmentation analysis to enable comparison with 2008 results. The main findings include both good and bad news. On the good side, a majority of U.S. voters believe public libraries are essential to their communities. However, there is still low public awareness of many library services, pointing to the need for better marketing and promotional work. The full report, a summary, an infographic, and more resources are available here.